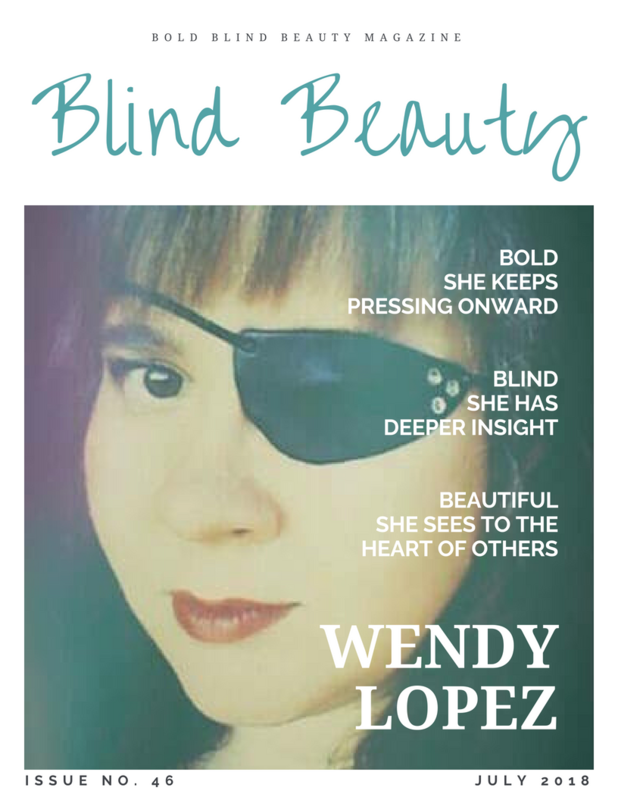 “Blindness comes in all kinds of shapes and sizes for sure.” I didn’t know Wendy Lopez before she wrote this comment in response to a Bold Blind Beauty Facebook post. This is one of the reasons why sharing our stories is so powerful—they bring us together. When you can’t see well it seems like the brain plays tricks on you. It’s hard to distinguish a bush from an animal or a pole from a person. Even close-up, numbers and letters can be confusing, for example, a 3 could be an 8 or a capital ‘B’ who knows? After losing her eyesight Wendy had to ask herself why she was giving up on her passion. In her words “there are a lot of blind artists out there” Wendy realized she is still an artist, photographer, and writer. Changing perspectives happens when we are out here living and doing those things that make us feel alive. Sharing our stories and connecting with others who can relate is empowering! The image is a faux fashion magazine cover titled Blind Beauty. In the photo, Wendy is looking fabulously fierce with a bedazzled black eye patch covering her left eye. In the left corner of the patch are 3 sparkling crystals. Wendy’s brunette bangs and makeup complete with red lip can be seen in the soft-focused photo. Your words are definitely empowering. Great story Wendy! I love your comment about how changing perspectives happens when we’re living and doing those things that make us feel alive. You are very inspirational!